Cape Town  is the second largest city in South Africa and is the capital of the Western Cape Province, as well as being the legislative capital of South Africa (the Houses of Parliament are here). It is located in the south-west corner of the country near the Cape of Good Hope, and is the most southern city in Africa. It is a stone's throw from South Africa's world-famous Cape Winelands around Stellenbosch, Paarl and Franschhoek. 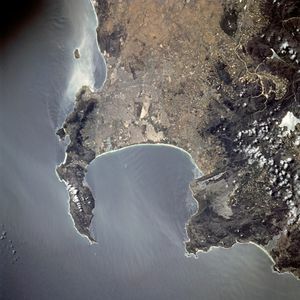 Cape Town seen from space: Most of the urban area visible in this NASA Astronaut photo is part of the greater Cape Town metropolitan area. Also visible are Stellenbosch, Paarl, and Fransch Hoek to the north east, and Kleinmond and Hermanus to the south east. Many Consider this peninsula to be the meeting point of the cold Atlantic and (relatively) warm Indian oceans; this can be felt in the difference in water temperature between False Bay and Table Bay. The first human heart transplant was performed on the 3rd December 1967 by Dr. Christiaan Barnard at the Groote Schuur hospital in Cape Town. Cape Town is less safe than you will be led to believe. As a newbie in town, you simply do not know the bad areas. ALWAYS take a taxi from the central bus station after dark. Better still, take one in the day time too, until you are more familiar of where to and where not to go, alone and loaded down with baggage. The police keep a fairly high profile during daylight hours, but less so at night. You'll get little help from the locals, as they fear for their own safety, too. Knife attacks are not uncommon. That said, it you're a careful you'll be fine. 10s of thousands of tourists visit Cape Town every year and are perfectly safe. The Cape Town metropolitan area covers a large area, from Durbanville and Somerset West in the east to Cape Point in the south and Atlantis in the north. The city centre is located in a relatively small area between Table Mountain and Table Bay. For tens of thousands of years, Cape Town was inhabited by the Khoe people known to the Dutch settlers as 'Strandloper'; South Africa's surviving Khoe people are related to southern Africa's indigenous 'Bushmen', who the Khoe called 'San'. 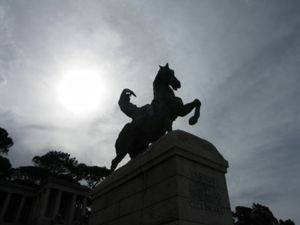 Cape Town's European history began in 1652, when Jan van Riebeeck established a trading post there on behalf of the VOC (Dutch East Indies Company). The first European settlers were mainly Dutch, with some French Huguenots that had to flee from religious persecution in their home country. The first settlers soon explored the adjacent hinterland and founded the cities of Stellenbosch and Paarl in today's Cape Winelands. The Voortrekkers (Pioneers of European descent) started from here to explore and settle the rest of South Africa. Today Cape Town is the legislative capital of South Africa. It is a world-class cosmopolitan city with numerous sites of historical significance, and a lively night-life, as well as a large gay community. The summer months are from December to February. Days are usually hot, but the humidity is low, so it is not uncomfortable. You should stay inside or in the shade during the midday heat and use sufficient sun block. You will fight for space on the beach around New Year's with all the local tourists but it is still a great time to visit as there are a lot of events happening. The winter months of June to August tend to be rather wet, which does not mean rain every day although it can rain for two weeks straight on occasion. It can also get very cold at night, with temperatures as low as 2 or 3°C (this is the temperature of the ocean so it will not get colder unless you go far inland) but 5-7°C normal. It will become warmer during the day, with temperatures between 9-15°C typical. It is often very cloudy with far fewer hours of sunshine. October and November: The weather is getting warmer. Spring is in the air, but it is not as hot as mid-summer yet. These months can be windy months. The South-Easter is known as the Cape Doctor as it blows away a great deal of pollution! December to February: These are the prime summer months of long hot days. The sun sets late in the evening (it stays light up until about 8:30PM in December) and there is generally a lot going on. February is the most reliable month for weather, with week after week of hot days. March to May: This can change from year to year, but generally it starts raining and the temperature begins to become cooler. There are far fewer visitors around, and you can get excellent deals on accommodation, food and most tourism services. During the dry summer months (even more so when there is strong wind) fire poses a serious threat to the flora and fauna of the region, especially the National Parks. The fynbos in particular can become very dry and burn easily. Over the last couple of years a number of fires have almost devastated the slopes of Table Mountain. Please take care not to be the cause of any runaway fire and report any fires that you might see to Table Mountain National Park Fire Management on +27 (0)21 689-7438 or +27 (0)21 957-4700 outside office hours. 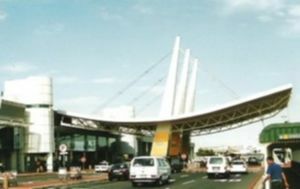 Cape Town International Airport is the second largest airport in South Africa (the largest being the OR Tambo International Airport in Johannesburg). There are multiple flights daily to Johannesburg, Durban and all other major South African cities, as well as the Namibian cities of Windhoek, Swakopmund and Walvis Bay and other destinations, including Gaborone, Maun and Nairobi. The most used airlines for international flights from Europe, the US and Asia include South African Airways, Lufthansa , British Airways , KLM, Singapore Airlines , Emirates , and Turkish Airlines . Further international flights arrive from Dubai, Doha, Amsterdam, Paris, Frankfurt, Kuala Lumpur, London, Hong Kong and Singapore. Formerly, nonstop service to/from the United States existed, but now, you must use OR Tambo in Johannesburg as a gateway city from/to New York City, Washington DC, or Atlanta. In the summer, (October-March) several charter airlines operate direct flights from all over Europe to Cape Town. Spare seats are sold with substantial discounts but during Christmas time and New Year prices rises significantly. Major local airlines include South African Airways , British Airways (Comair)  and low-cost airlines Kulula.com  and Safair . See also Discount airlines in Africa and Air travel in South Africa for further information. There are MyCiti buses from the airport to the city centre at 20 minute intervals. One way costs R65. The Muizenberg to Simon's Town Metrorail tracks run right along the ocean. Great views. The Blue Train  is the legendary luxury train service, and is by far the most stylish and comfortable way to get from Pretoria to Cape Town. In its long history, this train had served uncountable numbers of presidents, celebrities and other public figures. Private facilities in every room; many fitted with full bath. Fare includes overnight accommodation, meals, drinks (alcohol included), cigars, butler service and an excursion during the trip. All scheduled South African passenger trains are run by PRASA  (the Passenger Rail Agency of South Africa), which has different divisions for long-distance (inter-city) trains and commuter (suburban) trains. Shosholoza Meyl  operates inter-city trains and MetroRail  operates commuter trains in major cities. Shosholoza Meyl  has three classes of inter-city trains : Economy Class, Tourist Class and Premier Classe . In economy class there are seats only (no bunk beds), tourist class provides bunk beds for overnight trips (bring a sleeping bed or buy bedding on the train) and premier classe is slightly more luxurious and comfortable, with all meals and bedding provided. Economy and tourist class trains have a buffet car for food. Prices on the three classes vary accordingly. Cape Town's main train station is located in the city centre, on the corner of Adderley Street and Strand Street. All trains to or from Cape Town arrive and depart from here. - Queenstown on Thursday (Economy Class only). MetroRail  has two classes on commuter trains in and around Cape Town : MetroPlus (also called First Class) and Metro (called Third Class). MetroPlus is more comfortable and less crowded but also more expensive. Every trainset has both MetroPlus and Metro coaches ; the MetroPlus coaches are always on the end of the train nearest Cape Town. Prices are cheap so it is better to be more comfortable and use MetroPlus. Note that there are steep fines if you are caught in a MetroPlus coach with a Metro ticket (vice versa is allowed). MetroRail commuter trains are a great way to get between Cape Town and neighbouring towns such as Stellenbosch, Strand, Paarl, Somerset West, Malmesbury, Worcester and through the Southern Suburbs (Claremont, Wynberg, Retreat) or to the beaches at Muizenberg, Kalk Bay, Fish Hoek, Glencairn and Simon's Town. Contrary to many reports that you might read, MetroRail trains are safe, but it is probably wise to avoid avoid traveling at night if possible. If you need to use trains at night, use the most crowded first class (MetroPlus) car and don't stay alone. The train line from Cape Town to Simon's Town is fabulous ; from Muizenberg south to Simon's Town it runs right next to the sea. You can often see whales, and if it's windy you may have sea spray hitting the train windows. For the best views make sure you sit on the east side of the train (the left side as you face away from Cape Town and towards Simon's Town). This route previously boasted a moving restaurant coach (called Biggsy's) that did the return trip from Cape Town to Simon's Town between 2 and 4 times a day, every day except Monday. However, Biggsy's restaurant car was withdrawn from service on July 2007 for renovations and by June 2009 had not yet been re-introduced. 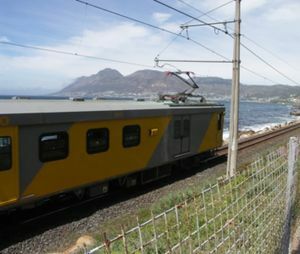 You can buy a Tourist "hop on, hop off" ticket for the Cape Town-Simon's Town route that allows you to get off and on any train for the entire day. Trains to Stellenbosch run every two hours (more or less), but this journey might take a while. Ask at the ticket counter if there is an earlier train you could use, as there are also trains to Stellenbosch starting in Bellville and Eerste River. Be aware of pedestrians on highways and National Roads, too! The vast majority of roads in and around Cape Town are in a very good condition, making travelling by car an easy issue. However, please be aware of hijackers at night or at traffic lights. The danger is not as high as often emphasized by the media, but a good portion of precaution should be taken. Please ask your hotel staff or anyone familiar with the area about where it is safe and where it is not safe. N1 runs north-east, passing Paarl, Bloemfontein and Johannesburg on its way from Cape Town to Harare in Zimbabwe. Also a good choice if you want to go to Kimberley and the northern Drakensberg. N2 runs along the East Coast towards the Garden Route, George and Port Elizabeth in the Eastern Cape, through the Wild Coast up to Durban and Swaziland. Note that the N2 is a toll road through the Tsitsikamma National Park. N7 goes north along the West Coast to the Northern Cape city of Springbok and to Namibia. Also follow it to go to Upington and the Kgalagadi Transfrontier Park. Hiring a car in South Africa is not as expensive as in Europe or many other countries. Petrol is also cheap compared to Europe but a bit more expensive than in the United States. The locals will tell you that the Cape Town drivers are the most courteous drivers in South Africa (except the mini bus taxi drivers who are unpredictable) and generally drive slower in comparison with other cities. All major bus companies have Intercity connections from Cape Town, taking you to other cities in South Africa and to Windhoek in Namibia. There might be up to 6 buses a day to certain cities. The starting point is next to the train station at the corner of Adderley and Strand Street, near the Golden Acre building. Please ask at the nearby tourist information or in your hotel for connections and where your bus is going to leave, as finding your bus can become difficult. Also, there are a few bus services available while travelling from eastern Africa, notably Tanzania and Kenya. The general route followed is Nairobi (Kenya), Dar-es-salaam (Tanzania), Lusaka (Zambia) and Harare (Zimbabwe) in order to reach Johannesburg. The journey from Nairobi takes about two to three days. Bus tickets can also be obtained from Computicket  . Cape Town is also on the Baz Bus  route. Most of the larger cruise lines, such as Princess Cruises offer Cape Town as one of their destinations. Unless you are staying within walking distance of the beach in Camps Bay (or some other area where everything you want is close by) then you will find it very frustrating not to have your own transport. Even short distance walks (like from V&A Harbour to the Castle of Good Hope) are problematic by foot, in a city with dividing motorways, and little or no signage or facilities for pedestrians away from the shopping precincts. There are numerous car rental companies located at the airport and throughout town. Remember that you drive on the left here which may take some getting used to if you've never done it. It may be difficult to come by an automatic transmission at the rental company so reserve your car ahead of time if an automatic is what you prefer. When you are ready to put fuel in your car, it is required to let one of the petrol station attendants fill it up for you. Just stay in your car, he/she will come up to and ask you which fuel type and how much you want to put in. Uber and Taxify are now ubiquitous, safe and relatively inexpensive around Cape Town. If you are going a longer distance, you can arrange for the same car to pick you up for an extra fee. Also a new car sharing ride provides a sustainable and save way to get around in the city, or even to other cities. Jumpin Rides is local start up changing the way of mobility in the city with connecting drivers with empty seats to people going the same direction. Metered taxis are widely available throughout Cape Town, though more so in more affluent or tourist-visited areas. Metered taxis can be identified by the typical yellow sign on the roof of the car, and by clearly stated information printed on the side of the vehicle stating the fare and the rights of the passengers. Be sure to take only those metered taxis that are marked in this way, but be aware that quality between different vehicles, even those with the same operator, can vary. Typical prices per kilometer range from R9 to R12 (equivalent to R14 to R19 per mile), often with a start or flag fall fee of up to R30 in 2016. For longer journeys, for example from the city centre to the South Peninsula, or Stellenbosch, it is often possible to negotiate a slightly better price with the driver. Keep in mind the metered taxi industry is under some pressure in Cape Town, and that paying the full rate benefits your driver and ensures the continuation of a sector that is comparably safe and convenient when compared to other transport options. The network of minibus taxis is the most extensive public transport system in Cape Town, and primarily used by workers as transport to and from home. Many people will tell you it's way too dangerous to use these mini buses, but a growing number of expats and tourists seems to be using them anyway, mostly without trouble but always use caution especially if you are a lone female traveller. The main security issue is the hazardous driving - speeding, crossing on red lights, intoxicated drivers. Although slightly worse than other modes of transportation, these are also common issues when using metered cabs, or even letting a friend drive you home (drunk driving is a big problem in all layers off the South African population). The main challenge using the system, is that there's no route map. You normally have to ask around a bit, and learn it over time. The main minibus station is located in the city centre, next to the train station. There you will find several platforms, each with the final destination indicated. Two popular tourist routes are Cape Town - Wynberg (which passes Observatory, an area with a few backpackers') and the Green Point - Sea Point - Clifton - Camps Bay route. Fares are cheap, and from Cape Town to Observatory, you pay 6 rand (Dec 2014). When jumping on somewhere along the route, you have to wave your hand to flag down one of the minibuses. They are usually tooting their horn to solicit passengers and will pull off the road if you wave them down. Licensed taxis will have a 20cm x 25cm blue and white sticker on the back of the minibus which shows their final destination. As of early 2013 the Camps Bay - City Centre route cost R6, although this will probably rise soon because of higher fuel prices. When in doubt, ask the driver what the fare is loudly so that everyone else can hear. The other passengers will watch out for you. Although there are normally three seats per row, they normally squeeze in four, and it can get very tight sometimes. It might be a good idea to take out some coins before you enter the vehicle, as it can be hard to reach down in your pockets as the taxi fills up. Most of the time there is a doorman manning the door, collecting money, and shouting the destination to prospective customers on the streets. Normally you take a seat, and he will ask you for the fare after a while. People behind you will commonly give you coins to pass on, and change will also make its way back in the same fashion. In some cases, the driver will collect the money directly himself. When you want to get off, you normally tell the driver a supermarket or other landmark. F.ex. Pick 'n Pay, Observatory if you want to get off close to the main street there (Lower Main Rd). They will mostly drop you off whereever you want along the route. The minibus drivers often drive dangerously, and are known to drive through red lights, drive in the yellow lane, and not give way to anyone. Most of the minibus drivers "own the roads", and there are some horror stories, among them an incident where a minibus driver failed to stop for a train at a railroad crossing, and was hit by the train. . Some minibus taxi operators have seen the value in the tourist market and are starting to provide safe and legal alternatives to the traditional minibus taxis. They are more expensive than the traditional minibus taxis, but still far cheaper than metered taxis. No guarantee you'll get to your destination directly, but it is safe, fun, and all the drivers are characters. You may even meet supermodels going to their photo shoots or artists going to their studios. During busy times of day (or year) you may have to wait a while and unfortunately, they do not take reservations. There are two bus systems that run in parallel in Cape Town. The older, slower and more extensive Golden Arrow network  ) offers cheap connections connecting most of the city. These are not recommended for tourists due to security concerns. They run mostly during the day. It is better to ask the driver where the bus is going, to make sure you won’t end up somewhere else. The newer MyCiti Bus Rapid Transport System started operating in 2010. The central hub for the system is the Civic Centre on the city centre foreshore. 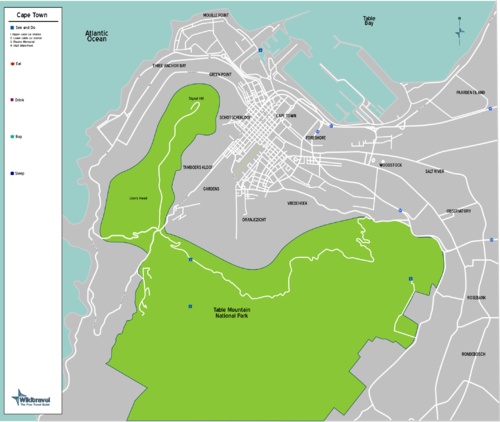 From there, routes radiate outwards to Tableview, Gardens, Walmer Estate and Salt River, Green Point (including the Waterfront) and the airport. The system is constantly expanding, however, so check out the MyCiti website MyCiti website for a current list of routes, maps and fares. Note that in order to use the MyCiti network you'll need to use a MyCiti cash card which can be purchased at their stations or participating outlets. You can purchase one at the MyCiti station at the airport and use it to get into the city. Once you've loaded cash onto the card you can also use it as a debit card for small purchases. You can also hire a scooter or a small motorbike. A number of places in the city offer this service and it is a great way to be mobile and save over hiring a car; however, unless you love the pain of cycling up and down mountains while dodging city traffic on narrow streets, cycling for transportation is not recommended. There is a system of public train transport, although it is mainly used by locals. Operator Metrorail  has done a lot to increase safety and comfort on board the trains, but they still do not live up to European standards. So make sure to buy a first-class ticket. Cape Town station is situated in the city centre on the corner of Adderley Street and Strand Street and there is a reasonable suburban network of lines with more than 80 stations. A nice scenic ride can be done south to Simon's Town, all along the east coast of the Cape Peninsula. Stick to the Simon's Town line and make sure you are not on the train after 6:30PM or when it is dark. Make sure you do not carry anything expensive on the train as this is an invitation to thieves. If you must carry a camera, make sure it is well out of sight (preferably a small wallet sized camera). Ear rings, necklaces and any form of visible jewellery are not recommended as these can be ripped (rather painfully) from one's person by an enterprising thief. Keep your wits about you and it will make for a pleasant and safe journey. Cape Town and Table Mountain viewed from Bloubergstrand across Table Bay. Cape Town City Hall near the Castle is an example of Victorian architecture. St James, between Muizenberg and Simon's Town is famous for these dressing rooms. West coast of the Cape Peninsula. Almost everything is possible in Cape Town, from a nice guided city tour through an adrenaline kick in an old fighter jet. The easiest way to get an overview on things to do, nice restaurants, clubs, tours etc is to walk into one of the visitors' centres which can be found in several areas. (V&A Waterfront, City Bowl, Green Point etc). A good option to consider is to make use of a reputable tour guiding company. They will be able to provide you with a knowledgeable tour guide, who will ensure that you get to see all the popular features of the city, as well as show you many of the often missed, hidden attractions. Ultimate-Escape South Africa (www.ultimate-escape.co.za) offers tours custom designed for your interests, and offers complete interactive tours for disabled individuals too. Climbing Table Mountain - Platteklip Gorge is the most accessible and therefore the most popular route for climbing up Table Mountain. 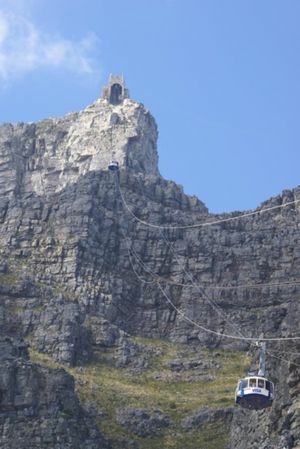 You start from Tafelberg Road and proceed up a steep gully to the top of Table Mountain. It's a steep 2 hours but well worth the effort and you can jump in the cable car back down to spare your knees. Be cautioned that the cable car does not operate in strong winds so you need to check before departing. Take water, sun block, hat and jacket. The cloud comes down unannounced and the temperature could plummet. Poorly equipped hikers often have to be rescued. Although it is very steep this route is extremely popular and you are guaranteed to meet many people on the way up and down. The gorge is shaded in the afternoon but earlier in the day it can be extremely hot with very little shade. Most of the route involves rock steps which can be challenging and many people find coming down even harder than going up. Don't underestimate the time and energy required for the downward section of this hike. Remember to take lots of water - this climb can be hot! Wear appropriate hiking shoes. Leave plenty of time to get down before dark. As this is a well known route and easy accessible, many inexperienced hikers attempt the climb. Take care, or consider a guide. Guided hikes can be booked through the ever resourceful local company SABP Tours or call +27 (0)21 813 6005, [email protected] Privately guided hikes are led by Cape Trekking on many of the lesser-walked routes of the mountain above Kirstenbosch, on the Twelve Apostles routes, or Devil's Peak. Cape Peninsula— Go to the Cape of Good Hope via Simon's Town and the African penguin colony at Boulders. Visit Cape Point in the Table Mountain National Park, maybe have lunch there before taking a hike in a quieter part of the reserve to immerse yourself in the essence of the landscape. There's a strong chance you'll find yourself among a herd of antelope, or zebra, a troop of baboon or ostriches. Then take Chapman's Peak Drive (if it is open) through Hout Bay and along the Atlantic seaboard via Llandudno and Camps Bay, stopping off at one of Clifton's famous four beaches. Surfing— Cape Town is one of the best places to surf. Muizenberg is a good place for beginners to learn to surf, Gary offers reasonably priced lessons from a shop facing the beach. Don't forget that the False Bay area (where Muizenberg is located in addition to Kalk Bay and Fish Hoek) is known for its sharks! If you're an experienced surfer, try the reef break at Kalk Bay, Outer Kom near Kommetjie or Misty Cliffs on the coast road near Scarborough. You could head up the west coast and sample Milnerton, Table View or Big Bay, although Big Bay is often crowded with people kitesurfing due to the windy conditions. When the swell is really cranking, the big wave surfers gather at Dungeons, near Hout Bay, for some of the biggest surfable waves in the world. Kite Surfing— Cape Town is one of the best Kite Surfing destinations in the world. Being on the South Western tip of Africa allows kitesurfers to gain access to two oceans, and the famous Cape Doctor which is also known as the South Easter blows most days from October until April. Cape Town offers great kitesurfing to those just starting in the sport as well as seasoned professionals who often spend their off season training around the Cape. Some of the most popular Kite surfing hot spots are Dolphin Beach in Blouberg Strand, Muizenberg and Langebaan Lagoon. Langebaan lagoon is one of the best places in the world to learn how to kitesurf, with its warmer waters, shallow sand banks and steady wind. Cape Town has some of the worlds best wine producing vineyards and arguably the worlds most scenically stunning on its doorstep. The wine regions of Stellenbosch, Franschhoek and Paarl are all with in an easy hours drive, these historic and lush regions offer stunning views and world class wine tastings. There are more than 250 wine farms within 30 minutes' drive of Stellenbosch - you can comfortably visit 3 or 4 in day. Most wine farms charge a tasting fee of R20 - R50, but waive this if you buy wine. You can self drive but you can not legally drink wine and drive so you will need to find a designated driver. The safest way to see the winelands is to trust your day to a dedicated wine tour company. An excellent day tour is offered by SABP Tours. Millers Point & Simonstown - on the way to Cape Point, ☎ 50 ([email protected]). contact Rob Naysmith from R4'000 per boat (4 pax) per day in False Bay to R5'000 for Tuna. Cape Town is one of the world’s best places to see the Great White Shark.Cape Town offers the most accessible diving opportunity to witness the great white shark that will leave you in awe of these magnificent ocean predators. Shark cage diving is available in Gaansbaai all year round. Between June and October you can also dive around Seal Island in False bay. Cape Town is one of the coolest cities on the planet, to make it even better, it has great surfing. Expect cold water, especially in summer when the antarctic currents brush past. Swell has an uninterrupted line all the way from Cape Horn - big powerful waves on offer! Alternatively swing round to the False Bay side to enjoy the tropical waters of the Indian ocean - Not exactly tropical but several degrees warmer. Winter months (June - August) are best with the most swell being pushed in by huge storms between Cape Town and the antarctic but generally South Africa is one of the worlds most surf spoiled countries, which means there is surf all year round, depending where you are. Contact one of the local surf shops below for more information. The sharks at the Two Oceans Aquarium are fed every Sunday, so it is relatively safe to dive with them. Cape Town is located near two oceans, the Atlantic and the Indian Ocean. Because of the Benguela Current the Atlantic Ocean is relatively cold (about 8°C to 14°C). The Indian Ocean is warmer (12°C to 17°C), and here you can see the more colourful fish. The official border between the two oceans is at Cape Agulhas, but currents and eddies take the warmer water futher west and these waters can reach the eastern side of the Cape Peninsula in False Bay, so from a diving point of view, the Cape Peninsula may be considered the interface between the two marine biological regions, and there is a notable difference in character between the waters of the two coasts of the peninsula. This manifests itself in the different range of marine life found on the two coasts. These regions are the South Western Cape inshore bioregion and the Agulhas inshore bioregion. The waters around the Cape Peninsula have been declared a Marine Protected Area (MPA). Permits are required to Scuba dive in any Marine Protected Area. This is a politically controversial issue due to disputes on whether due process was followed and whether the government deparment exceeded its authority, but the consequence is that a tax is imposed on all Scuba divers who dive in an MPA. The permit (valid for 1 year) may be purchased for R75 (2009) at a some branches of the Post Office, or a temporary permit valid for 1 month may be purchased at most dive shops. Failure to present this permit when requested by an official of MCM may lead to harrassment and possible arrest. Detailed information and suggestions on local conditions, service providers and more than 100 local dive sites is provided in the guide to Diving the Cape Peninsula and False Bay. If the open ocean does not appeal to you, the Two Oceans Aquarium also offer diving opportunities in their 2.2 million liter tank. There are many organized events in Cape Town throughout the year. An official calendar of events is available from Cape Town Tourism . Cape Argus Pick n Pay Cycle Tour, ☎ +27 21 681 4333 ([email protected]), . March every year. Total distance is 109 km. Start in downtown, cycle down the eastern side of the peninsula, past Simon's Town and back up the western side of the peninsula. Entrance fee is R250 for South Africa entrants and R500 for international. edit If you are not involved in or interested in cycling, avoid Cape Town on the second weekend of March, as it is difficult to travel as so many roads are closed. Two Oceans Marathon, ☎ +27 (0)21 671-9407 ([email protected]), . On Easter Saturday each year. An Ultra marathon (56 km), a half marathon (21 km) and a number of fun runs ranging from a 56m Nappy Dash to a 8 km walk or run. Maximum 10 000 entrance accepted per year per race distance (fun runs excluded). There is a pricing scale for each of the runs. The Ultra Marathon, R190 for South African residents, R300 for the rest of Africa and R555 for the rest of the world. The Half Marathon, R125 of South African residents, R215 for the rest of Africa and R335 for the rest of the world. The Fun Runs are priced from R10 to R20. edit If you are not involved in or interested in the runs, avoid Cape Town on this weekend, as it is almost impossible to go anywhere as so many roads are closed. Big Five Cape Town safaris are becoming increasingly popular. There are numerous safari game reserves with in 2 hours drive from Cape Town which is a great option if you don’t want to venture too far from the city. There are many hiking trails in and around the city, from short walks to multi day hikes. Cape Town has a very good network of trails to suit every level of fitness. Many of these trace the contours of the mountain and wander through the protea bushes and fynbos, often with breathtaking views. Many require no permit, although most of Cape Town's reserves have entrance fees. Hiking in a group is strongly recommended. The outdoor store Cape Union Mart has a hiking club with organized group hikes most weekends. Pick up a programme at one of their stores. You must phone the hike-leader first and pay R10. Paradise Touring, 021-7131020, . For guided walks up the mountain with a botanical guide. Cape Eco-Tours, 082-4604847, . A good one for twitchers to use and is a member of Bird Life South Africa. The townships are the places where people were forced to live (based on race) under the apartheid regime. To some extent townships continue to retain their apartheid-era racial make-up, for a variety of reasons. Townships have also grown to cover far larger areas of land than in the apartheid days. This is a result of urbanization, especially over the past 10-15 years. Touring a township may seem strange, even inappropriate, but it is a good way to learn about South Africa's history, and the poverty that many people continue to live in. People in the townships are friendly and the children love visitors. Some townships however can be dangerous (see the warning on the South Africa page) so don't go alone unless you know what you're doing. The townships tours are safe. If you want to bring sweets or gifts for the children, it is best not to give it directly to them, but to give it to the tour guide who will distribute them later. Tours can be booked directly or through one of Cape Town's many booking agencies. Tours run once or twice per day. Be aware that if you're given the chance to try some township food, that a 'walkie-talkie' is often made from the feet and beaks of poultry. The very best way to see a township is by foot and to stay overnight at one of the many township B&Bs. There are a number of small nature reserves in and around Cape Town. With South African wines becoming more and more popular worldwide, the number of tourists who visit Cape Town to learn more about the local wines is growing. The impressive variety of vineyards in Cape Town and the surrounding Cape Winelands make the choice which one to visit and which wine to taste very difficult. It is always a good idea to rely on one of the established wine tour operators. Guests should insist on a specialised guide with a thorough knowledge of South African wines. Mostly you will see Southern right whales, but on occasion you might also spot humpback and killer whales. Bottlenose and dusky dolphins also frequent False Bay. The Southern Right wales visit each year between June & November to mate and calve. From viewpoints next to the coastal road between Fishhoek- Sunny Cove railway station through Glen Cairn to Simon's Town one can often spot whales less than 100m from shore. At Cape Point whales can often be seen passing below. Cape Town's medical research is world-renowned, and Groote Schuur hospital is where Christiaan Barnard and Hamilton Naki performed the world's first heart transplant. There are several language schools in the greater Cape Town area. Shop around before you make your choice. Choose a school which is part of the e.g. IALC (International Association of Language Centres) or other certificate that ensure quality. Cape Town is an excellent place to learn to sail, with courses completed here recognized internationally and costs far lower than what you can expect to pay in more developed countries. There are various volunteering opportunities in Cape Town. The V&A Waterfront is the prime tourist destination for souvenirs, though these tend to be typically touristy (i.e. expensive and not necessarily authentic). More authentic curios for better prices can be found every Sunday at the Green Point market outside the Green Point Stadium on Sundays, in walking distance from the V & A Waterfront. Many of these same curios can be purchased during the week in the several multi-story shops at the lower end of Long Street. For the real deal with authentic artifacts complete with provenance and ethnographic background, go to Church Street where there are a couple of shops but be prepared for sticker shock. When buying African Curio, the price at open markets are almost always very negotiable and seldom does the item have a price sticker attached. People with foreign accents are often quoted twice to three times the price they sell to locals, so do negotiate. If you like South African wine, buy it here (or anywhere in South Africa) before you leave, because it is much cheaper and there is more availability than overseas. Top guide to wines is the John Platter's Guide, with a few others around too, and with thousands of wines available from the region, you will need a guide (see below for shops that have knowledgeable staff). Read Wine magazine (or the iconoclastic Grape) for the latest information. Distinctively Capetonian in character -- are everywhere, from chickens made of plastic bags to bead and wire work to pottery, glass and embroidery. If you don't buy a chicken from a Rastafarian at a street corner (the authentic experience -- about 30 rand depending on the size), then try Heartworks (Kloof Street or in Gardens Centre mall) or the Red Shed at the V & A Waterfront. There is also a high-end craft boutique in the Cape Quarter in De Waterkant. Contemporary South African art has been riding a big wave in the international art world. It is on par with the best in the world and undervalued (unless you buy a William Kentridge). If you like real art as opposed to curios, crafts or posters, and you have the budget for it, there are several serious galleries in town. Try Michael Stevenson Gallery first, then Joao Ferreira Gallery, AVA Gallery or Bell-Roberts Gallery, and there are several others worth seeing. Art South Africa is the art magazine to read if you want to know about the artists, and the adverts list the shows and the galleries. 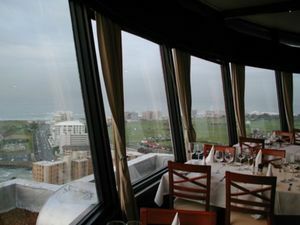 View over Greenpoint from the Revolving Restaurant in the Ritz Hotel. Food in Cape Town is generally of high quality. However, do not buy fresh fruit from street vendors, as it commonly makes travelers sick. The wines are much celebrated, but the surrounding region is also a major fruit producer, and the Karoo lamb is widely regarded. Seafood caught locally is superlative, but ironically much of it goes internationally (e.g., tuna for sushi) because of the prices that can be achieved. Ask about the local linefish -- yellowtail, cape salmon, kingklip, kabeljou and others are great eating. Oysters in season are also exceptional, farmed and wild from Knysna or wild flown in from Namibia. As one of the main tourist spots is the V&A waterfront, you will find a broad range of restaurants, but they are often crowded and expensive. Another highlight is the area around Long Street with its many cafés and restaurants (frequented by a multi-ethnic clientèle), while the trendy area of De Waterkant between Bo Kaap and Green Point above Somerset Road also boasts good food and a great vibe. Dine with supermodels and other beautiful people in Camps Bay, which has many hip eateries and nightspots overlooking the beach along Victoria Road. The Old Biscuit Mill, in the center of Woodstock, is a lovely Saturday market teeming with quality drinks and foods for a friendly price. Bree street is the new trendy street in the city and is slowly becoming the new Long street. With a wide choice of restaurants, bars, specialist food outlets this is where both locals and tourists hang out. Anything from budget meals to international cuisine - popular for lunch and dinners. Kloof Street & Park Road in Gardens area is the latest hip urban cool area and is an excellent eating place away from the tourist throngs with a variety of bistro / sushi / hipster type places serving the young professional and bohemian crowd. Farther afield, Hout Bay on the west side of the Cape Peninsula is very good for fresh crayfish (lobsters - they have become quite expensive, around R300, though). Kalk Bay on the east side of the peninsula offers a big variety of fresh fish, do check out The Brass Bell. The restaurants in nearby Simon's Town are also good. Do not neglect the Cape Winelands for food if you have a car. In Stellenbosch, Spier has several restaurants, including the fun, afro-chic Moyo, and many wine estates offer food of different types and quality. The village of Franschhoek is the culinary navel of the wine region, with Le Quartier Francais a perennial five-star winner, but only one of many excellent restaurants. In the Constantia Valley there are number of great restaurants including Pastis Brasserie, Wasabi, The River Cafe, La Colombe and the Constantia Uitsig Restaurant. NB: Make sure you know what the price is before you order rare delicacies in restaurants as there have been a few rare but high-profile cases of heinous overcharging where the price is not on the menu, particularly for perlemoen (abalone) and crayfish (similar to lobster). Long Street, which can be easily reached from St. George's Cathedral and the Greenmarket Square, is famous for its bars, restaurants and clubs. This is the ideal place if you want to end the day with a drink. It is also one of the few truly multi-ethnic, multi-racial nightspots in the city. See the new South Africa, not just other tourists. You will have live entertainment (normally something like jazz or kwaito music) in many bars and sometimes you will have to pay to get in. Kloof Street is a short walk up Long Street. But crossing in to Kloof is more than a walk in terms of style and vibe, the Kloof Street Park Road area is the home of Cape Town's uber cool. There is a vibrant nightlife with restaurants, bars and all manner of hipster drinking spots. The area is also home to UCT's art school and Varsity College art school, this area always has something going on. A popular destination with locals is Camps Bay, which offers a vibrant night-life and many bars, restaurants and clubs. Era Night club, 71 Loop St, Cape Town City Centre, Tel (021) 422 0202, electronically based and aims to mentor and uplift the local electronic music scene. District, 61c Harrington street, Cape Town, Hip House and Techno. HQ, 100 Short Market Street, Cape Town, Parisian styled steakhouse, and bar is situated in the busy historic heritage square. Aces and Spades, 62 Hout Street, City Centre, Cape Town, Rock - themed pub situated in the city Centre, they offer karaoke every Wednesday of the week. Accommodation in Cape Town ranges from hostels (of which there are many) to luxury accommodation. Actually, there are so many hotels, B&Bs and guest houses that it can be difficult to decide where to stay! Staying in city centre can often work out cheaper as obviously all the attractions are to hand, but stick to one of the neighbourhoods next to the central area for better prices and a quieter nights sleep. The area around vibey Kloof Street in Gardens/Tamboerskloof with its young cafe culture and hip shopping is a good choice. You could consider sleeping in one of the suburbs. It is normally quieter and there is less traffic than in Central Cape Town. The suburbs in the south, like Muizenberg, Fish Hoek or Simon's Town, or near the winelands (see Cape Winelands)are ones to try. Areas along the western seaboard of the peninsula (such as Camps Bay) will be more expensive. If you have a cell phone get one of the cheap prepaid sim cards from either Vodacom, MTN, Cell C or Virgin Mobile and save money on local calls. Overseas calls at local rates via the Celldial service. Call 087 940 6966 and follow the voice prompts. See www.celldial.co.za for supported countries. Internet is available throughout Cape Town, and the inner city cafes are always hubs of activity. Charges per hour range from R5 (in town) to R50 (V&A waterfront). Other internet cafes can be found all over the city and suburbs, with many coffee shops offering internet access. Many Guesthouses in Cape Town provide WiFi free for their guests. Always-On  , +27 (0)11 575-2505, provides prepaid wifi access in a number of locations in Cape Town. Simply connect to the access point and you will be given the opportunity to pay for access by credit card. Pricing starts at around R15 for 10 minutes or R60 for 100MB. Cafe Neo, located opposite the lighthouse in Mouille Point, offers an open hotspot in addition to their excellent Greek food. Although Cape Town has its share of violent crime, you are safe if you keep your wits about you as you should in every large city around the world. As a visitor, you are less likely to encounter problems while visiting the townships if you are escorted by a township resident—though you should not really venture into the townships without a fairly large group of accompaniment. Official township tours are your safest bet; revealing a very interesting lifestyle to the more curious tourists. The CBD (Central Business District) has been cleaned up over the years, but some con men and cholos do still exist, although during daylight police make themselves known. Simply put, leave everything you value—especially your papers and tickets—in your hotel room safe if you plan to stroll through Cape Town. The area at the bottom of Main Road near Prestwitch Memorial, has become notorious for robberies and assaults, day and night. Be very careful on Long Street and surrounding roads at night, especially the further North along the road you go. Do not, under any circumstances, play games with the street kids, they are most likely trying to steal your phone and wallet. They will not get violent, but they are talented pickpockets that even catch the locals on occasion. Common tricks used to rob people of their belongings include asking to compare shoe sizes (where the robber will stand next to you to compare shoes and then reach into your pocket), asking for the time (snatching your phone as you pull it out of your pocket) and asking for a fistbump if you are walking around with your hands in your pockets (thus exposing your pocket). Drug dealers are exceptionally brazen on Long Street, so expect to be offered drugs about multiple times if you are out clubbing on a busy night. Foreigners should avoid hitchhiking and be aware of automated teller machine (ATM) con artists. Under no circumstances allow a stranger to assist you in your transactions. Should your card become stuck in the ATM, call the helpline number on display at the teller machine for assistance and to cancel your card. During day time it is quite safe to walk around the city center. People and beggars are in general quite respectful and accept a "no", although persistent beggars are more common in the city center. During the evening, you must take a taxi to and from your destination, rather than walking. Make sure you take a taxi card with you, so that you can have the driver meet you outside the bar or restaurant. Watch out for the mini bus taxis. They often drive like hell disobeying many traffic rules. Watch out for pickpocketing. At night, make sure you stay on well-lit and crowded streets. Crime is especially high in Salt River, Observatory, Mowbray, and the Cape Flats. Glue sniffing children and junkies are a minor problem, called 'strollers' by the locals: these ragamuffins will strip you bare if you do not stay alert. While driving in a car be more aware of people approaching the car at traffic lights for smash-and-grab theft. So don't leave valuables on the seats or your lap. Make sure to roll your windows up and lock your car after parking it. Baboons can be dangerous if provoked, as they are strong for their size and have large canines. They have adapted greatly to tourists, and will try to steal food if they see it on your person. They have also learned how to open car doors, so make sure to lock your car when you're in an area with a lot of baboons, even if you're inside it. If you go to the mountains, go in a group of at least 4 people. You should try not to appear to be a tourist, but keep in mind anyone can be targeted. Targeted tourists are generally spotted wearing cameras, shorts, jewellery and golf hats—try not to do this. Do what you can to blend in, and if anything happens—do not try to be a hero: rather, give them what they want. Cape Town is positively located for many day or two day trips, offering a variety in landscapes and cultures. Choose self drive or guided tours. Boulders beach is famous for its penguin colony and you can watch penguins in their natural habitat. September is the breeding season and if you are very lucky you can see penguins hatching out of their eggs. Visit the Cape of Good Hope to experience the wildness of the natural habitat preserved here. Stunning views and for sure you will meet one of the local baboons or ostriches. Be sure to stop in Simon's Town on your way back to relax with a wonderful view on the False Bay. Hout Bay — also known as the "Republic" of Hout Bay by its locals — is a beautiful bay on the Atlantic coast. 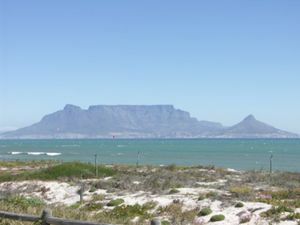 The bay is protected from the north westerly and south easterly winds, but is open to the south westerly wind and prevailing swell which can produce some of the worlds biggest surf at "Dungeons" and "Tafelberg reef". It has a quaint fishing harbour, which provides protection from the south westerly swell. Boat trips to Seal Island (more accurately Duiker Island) operate from here. While you're there try the fish and chips at the Café on the Rocks at the end of the harbour road - a local secret. Chapmans Peak— Experience one of the most scenic drives in the world. As you drive up the Chapmans Peak Drive and look north over Hout Bay, the view of the bay and the fishing boats is stunning. Bontebok, seen in De Hoop. Only two hours from Cape Town are the Bontebok National Park and the De Hoop Nature Reserve, perfect for spotting bontebok and whales. The southern tip of Africa, Cape Agulhas is not far away. The Overberg region offers whale spotting and quiet towns to relax. The world-famous Garden Route ranges from about Mossel Bay, via George and Knysna to the Tsitsikamma National Park and the Addo Elephant National Park. Bloukrans Bridge offers the highest commercial bridge-based bungee jump (216m) in the world. This road will take you further on to Port Elizabeth, Durban. Do not forget to visit the Karoo and visit an ostrich farm and the Cango Caves in Oudtshoorn. Go up north along the West Coast to Saldanha Bay and all the other hidden spots. Further on are Namaqualand and finally Namibia. Visit Melkbos to surf, windsurf, kitesurf and sunbathe on its wide sandy beach and also see the only working Nuclear Power Station in Africa. This page was last edited on 20 April 2019, at 12:19.